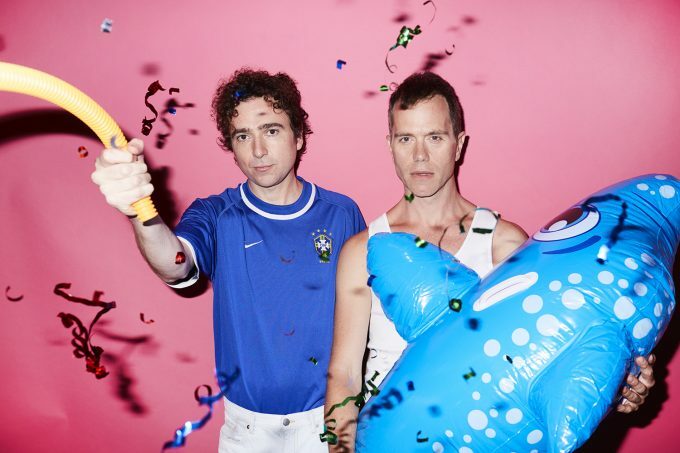 For our latest Q&A, Brad shot through a series of questions to the boys from The Presets, who are gearing up to headline Sydney’s New Years Eve In The Park. Master Kim Moyes from the band shot these answers straight back to us! Q. You’re set to headline New Years Eve In The Park alongside Jungle Giants, Hayden James, the Thundamentals and CXLOE. What can fans expect from the set? A. Our current live set is as mix of new and classic Presets material. It’s a full throttle audio/visual experience that’s designed to leave you sweaty and charged. Q. You’ve played all the big festivals in Australia and around the world including Coachella twice. What do you feel makes for a great music festival? A. I think a diverse line-up always makes for an interesting festival. It helps if the location is fantastic and there are plenty of magical little extra details to help change up the environment but at the end of the day, what makes the best festival experience is the crowd and the energy they bring. Q. How do you warm up for a show? Any weird warm up rituals or superstitions? Lucky red socks perhaps? A. Nothing as interesting as sock colour choices. All I need is just a little bit of quiet time to focus, a bit of warm up so my hands don’t get sore and a cheeky shot of tequila. Q. I remember discovering you on the iconic Ministry Of Sound ‘Annual’ in 2007 with the incredible track ‘I Go Hard, I Go Home’. These compilations no longer have the impact they once did and the lockout laws have destroyed the Sydney music live scene. Do you have any advice for artists trying to break the music industry now? A. Anyone who is trying to make a go in any creative pursuit needs to be driven entirely by self-determination. Nobody else is going to make it happen for you and if you have enough drive, even through the times you really feel like quitting then your determination should get you quite a long way. Q. Outside of The Presets you are both respected for your song writing and music contributions. Julian co-wrote Silverchair’s mammoth hit ‘Straight Lines’ while you’ve written with PNAU and DMA’s. Are you still writing with other artists? A. Both Julian and myself are always working with other artists and on very different and diverse projects to The Presets. It’s important and keeps us energised and excited about music. Q. ‘Do What You Want’ has been nominated for Best Video at the ARIAs this year. The film clip is hilarious, epic and liberating. Do you have a favourite moment/s from the video? A. I think the black and white cowboy section is very stylish and fun. A. Those three are nearly always bulletproof songs for us to play live. Always fun and always get the crowd going. Q. You commemorated the ten year anniversary of ‘Apocalypso’ with a lovely speech thanking (mostly queer) students for your loyal following. I know first hand about this after being hit on in the audience during one of your shows. Why do you feel the LGBT community connects with you so much? A. The LGBT community in Sydney was amongst the first to really embrace The Presets back when we started out. Parties like Club Kooky and Bad Dog really believed in us and championed us and we really felt that sense of family within that community. We have since gone on to play seminal queer events all over the world from Folsom St in San Francisco to the Christopher St Parade in Berlin. I guess we are all about freedom of expression and having a great time through the energy of music. We have always felt very at home within the LGBT community and I don’t think it’s ever been exclusively about sexual expression its just more of an attitude I guess. Q. ’14U+14ME’, ‘Downtown Shutdown’ and ‘Martini’ have all been fun single choices from your album ‘Hi Viz’. Can we expect another single soon? A. You sure can! Keep your ears peeled. Q. You’ve just wrapped up your US tour after doing a headline tour in Oz in June that included a stint at Splendour In The Grass. Any chance you will be touring again in 2019? A. We have a few shows lined up for 2019 and plans for new music ASAP. Q. There was a gap of six years before the release of ‘Hi Viz’. To your credit your fans have never left you. Why so long? A. Some things just take time I guess. There were a lot of different projects that we were working on during the time it took to make ‘Hi Viz’. Q. It’s been so exciting to have you back. Thanks for the new bangers. Can you please release music sooner next time? The Presets’ latest album ‘Hi Viz’ is available now. They’re set to headline New Years Eve In The Park at Victoria Park in Newtown on New Year’s Eve.